People often ask, "Is a New Order mining permit an excellent investment, enabling one to mine safely in highsec for an outrageously affordable ten million isk?" The answer is yeah, pretty much. It's exceptionally rare for a permit-owning miner to be ganked. But in extreme cases, ganking permit owners can be necessary. After all, though a New Order mining permit an excellent investment, enabling one to mine safely in highsec for an outrageously affordable ten million isk, it's not a license to disobey the Code. 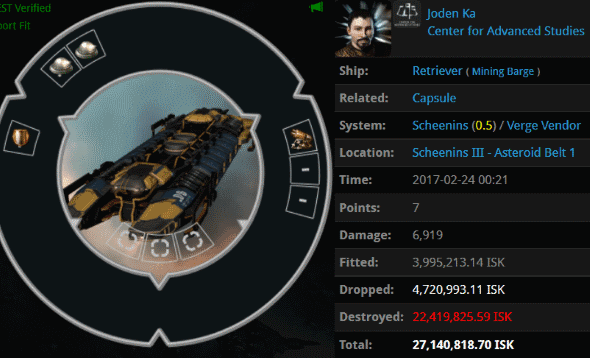 Joden Ka went AFK while mining in a fail-fit Retriever. Agent Zopiclone saw no alternative but to gank the Retriever. The destruction of Joden's implants was also deemed necessary. Zopiclone > What is your excuse for not following the CODE and mining AFK? Joden was disappointed that his permit hadn't kept him safe, but it didn't take long for him to confess to violating the Code. The miner admitted that he'd been mining AFK for (at least) three minutes. But he tried to put Zopiclone on the defensive anyway. Zopiclone > Miner calm down please. Joden Ka > calm down? Zopiclone > Miner you were clearly AFK! Suddenly, the story changed--a classic sign of carebear deceit. At this point, Joden must've regretted confiding in Zopiclone about the unauthorized three-minute conversation with his family. But it was too late. Joden tried sticking to his new story, that he hadn't been AFK. Zopiclone wasn't buying it. Why couldn't the miner just be honest with her? Zopiclone > Were you trying to run a scam by buying a permit and not following the code miner? Zopiclone > Were you trying to pull a quick one over us? Zopiclone > Congratulations. Thats a fantastic life event. Zopiclone > You've admitted that you were AFK for 3 minutes "talking to family" ,,, now you are saying you were by your keyboard... which one is it? Zopiclone > So which part of the law of highsec did you break? since you WERE a permit holder. Joden couldn't help but incriminate himself further. He once again admitted to going AFK, but complained that it was unfair because his ship began taking damage just as he was sitting back down. Needless to say, Joden wasn't an expert in the Code. Zopiclone > You clearly were not following the law of HighSec. Zopiclone > I even said Permits please in Local. More excuses followed. Joden refused to accept responsibility for his crimes. The carebear's shifting story got him into more trouble. Even by his own logic, he couldn't use his family issue as an excuse, since he was supposedly at his keyboard when the gank occurred. Zopiclone > The Law is the law you cannot break it to suit your needs. Zopiclone > You could have docked up. We allow this. Zopiclone > Your true colors are coming out. The miner's true nature was revealed. He only cared about himself and his isk, and possibly his family. He didn't care about the Code at all. Interesting priorities there. Zopiclone > You were breaking the law and you know it. Now you are trying to turn the tables. Joden Ka > and im in the wrong here? As Joden raged, his story about the timing of the gank grew fuzzier. Still, Agent Zopiclone took Joden's complaints very seriously. She knew her reputation for fairness was very much at stake. Zopiclone > Yes so you were not by your keyboard. We established this breach of your duty to the law. Zopiclone > Miner I have invited you to a channel to plea your case. It was time to bring this matter before an objective, impartial audience. Zopiclone would put the decision in their hands. I have a hard time buying this Miner's story. Having bought a house myself within the last two years, I know that this process is very time consuming, more so if you're selling one as there are a ton of things that you have to do. So then the question becomes; why was he even playing the game when he is in the process of selling. The math is simple and it isn't adding up. The agent is clearly in the right here to enforce the Code. "(Protip for all the men out there: If you're planning to ask a woman to marry you, it's a classy move to ask an Agent's permission. It's not sexist or patriarchal; it's just good manners.)" But why didn't antiganking stop the gank? Because they were too busy failing! This miner bought a permit out of convenience rather than dedication to The Code. How else could he figure that it's OK to be AFK for a few minutes, or that the reason would matter? For shame. Miners must ask an Agent's permission to be AFK for any reason, for any length of time. This includes house fires. miners must also ask an Agent's permission when attempting romantic liaisons, accompanied by pictures. This is for the protection of the human gene pool. human gene pool... Das Stichwort ist gefallen. Spielwiese für Rassengentiker. Lol, stinking krauts are triggered! If a RL event is sufficiently important to go AFK for, then the resultant IG loss should be minor enough to be written off. In this case, I estimate the value of his retriever to be 4.5*10^-10 times as valuable as his house. Priorities! If Zopiclone is back ganking does that mean that the other big code theft also was a ruse? You code guys really know how to mess with the truth. James 315 welcomed Zopi back into the New Order, inviting him into His own corp. It would be nice to one day hear the full story. 2. Create a new gallente alt, do the intro mission, do the agent mission for mining till you get your Venture. 3. Mine for a while and then ‘wander’ into the belts in Uedama. You got to really get into this role. Be the newbie. 4. When you start to mine along with all the ventures in Uedama (there are a lot these days) you will get ganked within 1 minute of activating your mining laser. 5. Complain in your npc corp chat that you just got killed. Act like a newbie. 6. You will get convoed by an agent within a minute of dying. Act slightly irritated but intrigued, knowing that you know near nothing. Then act like your interested. 7. Within 10 minutes you will be in possession of a fully fitted gank atron and in fleet with a couple Code monkeys. 8. Here is the tough part, they are going to lead you to another miner and gank them. Make sure to get their name so you can reimburse them latter. Act really excited about the whole thing. 9. Tell them you want to do it again. 10. Pull concord with them. 11. When they go after a bigger target be sure to only do a little bit of damage, so the gank fails. 13. Act like you need to log off soon. They will rush you through the last process: give you 50 million and invite you to their dumb channel (the password is 315 by the way). 14. Make sure you reimburse the poor chap that you killed in step 8. 15. Post the whole experience here in their stupid blog. Lol! You don't get it Mr Rockmonster, the Code always wins. Always. If this criminal just came back to the game after being away for over a year, his permit was expired anyways. Justice was served.